One day I'll be in Paris: Not so chic. The weather has been rather chilly these days, feels nice to be wrapped up from head to toe. Piled on every colour that I feel affection for - black, white, grey and blue, the occasional pastel and then a flower garland for good measure. Quite an emotional week for me, going through a bit of a tough time figuring out life, friendships and love. I guess year end brings out alot in people..with all the 'reflection' we're supposed to be doing. For the lack of better word(s), I bring you this song which aptly sums up all I feel. What a year. Really, you have no idea. But on the fashion front, I am IN LOVE with these pieces from pixie market... WANTS! majorly dude. Am seriously considering the wool cape coat, it's such a gorgeous cut! 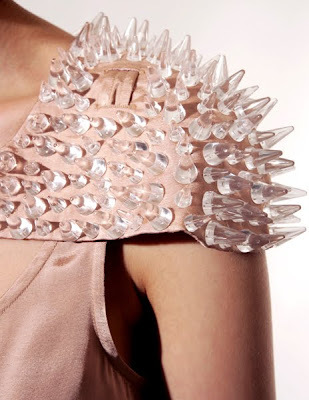 The clear spike harness top is so majorly fierce I cannot NOT have it right? I am also not too sure about my look today, too casual? Guess we all have our non-chic days. Still it's comfortable. :) I got a haircut over this Christmas, something about shaving your hair that is quite cathartic in some ways. Thanks muff! Don't mean to be one of those blogs that is incessantly pessimistic. But until then, I am not really having yipee type of days. Oh, the sweeping insensitivity of this still life.